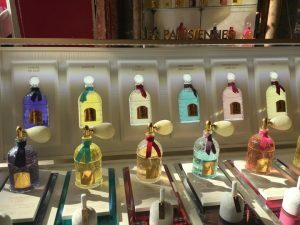 February in Paris is still pretty chilly but the highlight of my visit last weekend was a visit to La Maison Guerlain on Avenue des Champs- Elysees to explore the fragrance archives and to smell some of the very first perfumes created by the family Guerlain. The beautiful store in the centre of Paris which in 2013 the company described as being re-enchanted is always a joy to visit but last weekend was particularly special, I was going beyond the shop and into a different era of perfume. A group of perfume enthusiasts from The Perfume Society were guests of Guerlain, we were full of anticipation at what could only be a magical and enormously interesting few hours of perfume history which we were about to embark on. After more than two hours of sniffing 20 fragrances I think I was becoming nose-blind and was not truly appreciating what we were smelling – back in London almost a week later I returned to the blotters, some of the fragrances had faded over the days but the ones I could still smell were quite exceptional, undoubtedly perfume Masters of their time – the opportunity to experience historical fragrance is rare, Guerlain have a unique perfume patrimony, generation after generation of the family have continued to create outstanding perfumes up until the present day. The history, poetry, romance and art associated with classic perfumes is as bewitching as the creations themselves and since Pierre-Francois-Pascal Guerlain created the first fragrance for the Company in 1840, Pois de Senteur, the poetry and desirability has not faded. The style of fragrance was quite different in 1840, perfumes were mainly created from natural essences, perfumers did not have synthetics and if it was impossible to obtain an extract from any part of the flower or plant, then the perfumer would mix several essences together until he had created an interpretation of the note he needed for his accord. During this time perfume was only worn by royalty and the noble classes and the perfumes were mainly florals such as roses, orange flowers and jasmine. Musks, Civet and base notes were heavy but favoured by both sexes – in an age of inconsistent bathing practices, perfume served as a popular mask to the very strong body odours and the appalling smells prevalent throughout Paris. In 1889 The House of Guerlain produced Jicky – this perfume was created by Aime Guerlain and was the first of Guerlain’s perfumes to contain synthetic materials – the perfume was created with men in mind but Jicky quickly became fantastically popular with both men and women and is thought to be the oldest continuously produced perfume in the World. After a wonderful afternoon delving into the perfume history of the company, I returned to the Guerlain store the following day to remind myself of some of their modern classics – although Jicky is now 127 years of age, it still feels modern and maintains the lasting significance of a true classic. Les Parisiennes are beautiful scents for Spring and Summer. 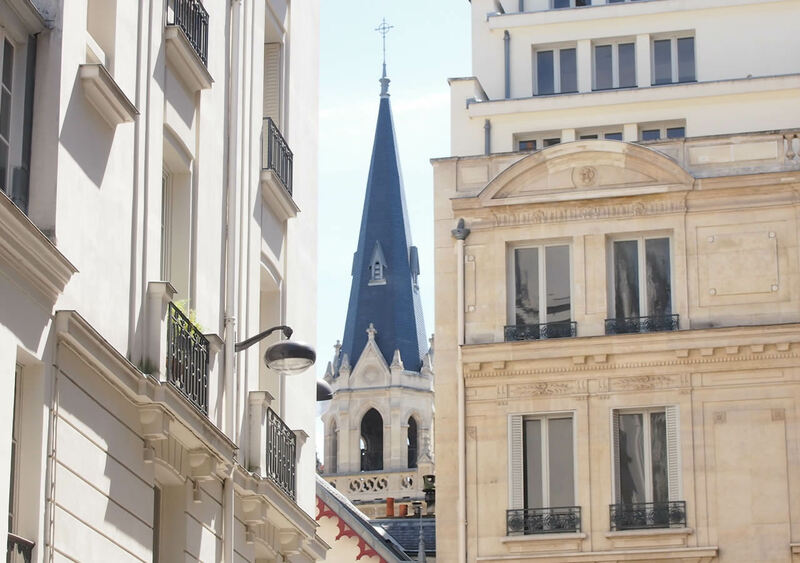 The sun shone bright on the Avenue des Champs-Elysees and throughout Paris last weekend. 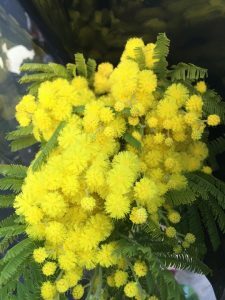 The unmistakable yellow and heady fragrance of Mimosa looked delectable in local florists, a reminder that Spring is just weeks away and the wonderful blue hue of L’Heure Bleue hung over the City as dusk fell.